Paulist Fr. Mark-David Janus has served as president and publisher of Paulist Press since 2010. In 2015, he edited the Paulist Press book "Crossing the Threshold of Mercy: A Spiritual Guide for the Extraordinary Jubilee Year of Mercy." In 2018, he authored "Your One Wild and Precious Life: Thoughts on Vocation." A native of Rochester, NY, Fr. Mark-David earned an undergraduate degree at St. John Fisher College, a master's degree at The Catholic University of America and a Ph.D. in psychology from the University of Connecticut. He made his first promises to the Paulist community on August 16, 1975, and was ordained a priest on May 19, 1979. Fr. Mark-David has served as a psychologist in private practice and has taught on the faculty of Michigan State University College of Human Medicine, The Ohio State University College of Medicine, as well as Indiana University and Purdue University. His research and publications have focused on adolescent psychology and at-risk youth. 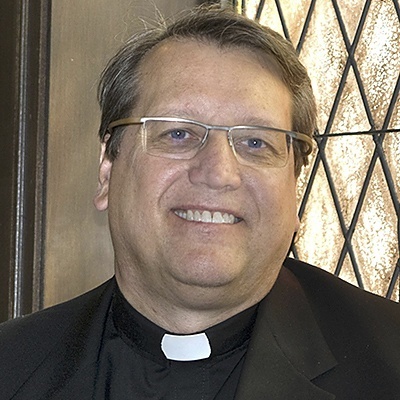 From 2003 to 2010, he was based in Grand Rapids, MI, serving as director of the Catholic Information Center in that city. From 2008 to 2010, he also was rector of the Cathedral of St. Andrew. Fr. Mark-David lives today at our motherhouse in New York City. In addition to his work at Paulist Press, he often celebrates Mass at our mother church, the Church of St. Paul the Apostle. You may follow Fr. Mark-David on Facebook (where he often shares homilies and reflections) and see photos from his ministry on Pinterest. He can be reached via email or by phone at Paulist Press at (201) 825-7300, ext. 200.